This unit comes with the Quantanium dry tumbler. This tumbler utilizes a non-stick coating, making it the best bud trimmer in the cannabis industry. The Quantanium dry tumbler is resistant to damage and the non-stick properties prevent trichomes from sticking to its surface. This results in up to 40% greater trichome preservation during the trimming process! The CenturionPro® Original and Silver Bullet are the best industrial trimmers on the market. These twin trimmers are perfect for medium-size operations and continue to prove themselves time and time again. Composed of anodized aluminum and stainless steel, they are as rugged as they are powerful. If you’re looking for an innovative flower trimming machine that maximizes your productivity, look no further than this professional trimmer. 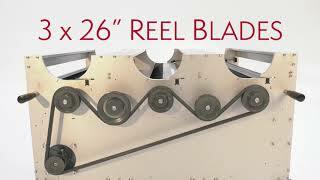 With an 11-blade Toro hardened cutting reel, the Original provides 37,500 cuts per minute! The high processing capacity allows them to harvest 16-20 lbs per hour of dry product (80-100 lbs wet) and replace up to 25 human trimmers. The CenturionPro® Original comes with a strong 3 horsepower leaf collector that runs on 220 volts, in addition to an extra-large hopper for easier feeding. Plus, the finely tuned diverter and double-bag system work hard to preserve trim and save your keif for future use. • The double-bag system designed for cleanliness, as well as trim and keif collection so you don’t waste any valuable product. • Dimensions: 30" x 13" x 28"